Is it a water hazard? Is it a bunker? Maybe it's both. Actually it can't be a water hazard as it is not marked as one. Therefore it must be deemed casual water in a hazard. Definitely not something you like to see but all too common is this seen in our region after a strong weather system has passed through. In the first 48 hours of this week we received over 3 inches of rain and our soils were already at holding capacity so we are seeing some standing water on the property. The interesting thing is we are only seeing standing water in the old bunkers. Because of the new vertidrain (deep tine aerifier), there is not one area of standing water on fairways, greens or tees. I can't say how much that new machine has improved our playing conditions. Now check out one of our new bunkers this morning after yesterday's deluge. Isn't that awesome. You know, not only is this bunker free of standing water, it is also free of any wash outs. In fact if this bunker wasn't full of leaves it would be very ready for play without my staff having to do anything to it. That is the beauty of new bunker sand, and a new bunker with drainage that is functioning properly. So you can probably guess that I am thankful for this beautiful bunker and that soon all of our bunkers will be as functional as this amazing specimen on #11. Well of course that is true, I am thankful, but I'm thankful for a lot of things and since this is the week that it is.................I will share some of those things I am thankful for. First and foremost, I am thankful that I had the pleasure of knowing John Harbottle III and that he actually referred to me as "a friend". Without John's vision and leadership, I can tell you with complete confidence that we would not be working on a complete master plan today. And, I can also say that we wouldn't be embarking on this plan in such bold fashion. The new "Golden era" bunkering that we're creating today is based on those six prototype bunkers that John created this past spring. They are not only amazing looking, but they are excellent hazards with just the right amount of penalization. John was brilliant but he was also just a great man which is why I admired him and aspire to be more like he was. I try and never get personal on this blog but come on.......... look at my four beautiful children. They are such a blessing. No matter what kind of day I'm having, they make me smile. I am so thankful for them. Of course my wife is the ultimate love and joy in my life, but if I put her picture in here, she'd kill me. You're just going to have to trust me that she's gorgeous. I am so thankful for her and the family. Okay..........Back to work.........I am thankful for the past President of Tacoma C&GC and his leadership with his Board. They had the courage to trust John and I with our plan to restore this golf course to it's glory of old. The new teeways and the classic bunkering will create a golf experience that you won't find anywhere in our region, or perhaps the entire world. Thank you for "going for it". I am so thankful that the Club purchased this amazing machine. I'm not kidding.........I'm sure you're tired of hearing this but in case you didn't know it, Puget Sound gets a little rain. Drainage can make or break a golf course in our region, and Tacoma has always drained well, but now, with the help of the Vertidrain 7416, our drainage is borderline ridiculous. 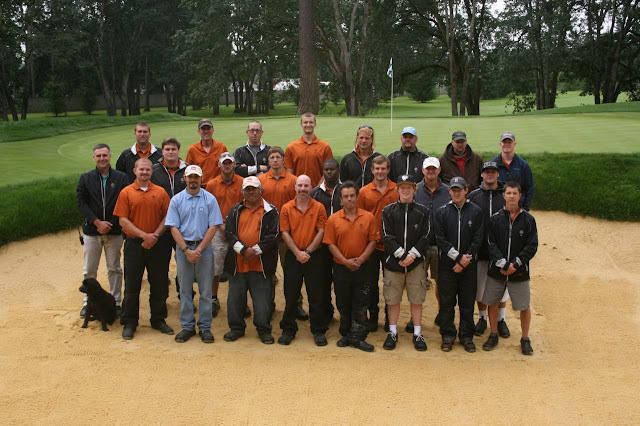 I can't say enough about the staff here at Tacoma C&GC. This group works hard, and I think the main reason this group is such a good team is that they want to be here. They like what they do. They're very good at it, and I love coming to work each day to watch them in action. Right now the restoration project is overwhelming, but this group is ready to take it on and get'r done. I am so thankful for this group of people. Yes, I am thankful for Snowpocalypse 2012. Really what I'm saying is I love mother nature. This past ice storm was devastating in many ways, but it also cleared out some cluttering trees on the course and opened things up. I am thankful that my job is dictated by mother nature. You never know what she's going to throw at you, and you're always surprised at how the outcome is usually an improvement. She knows what she's doing. Don't fight it or worry over it. I'm thankful for Nick Schaan and Kip Kalbrenner. These two guys have been instrumental with the facilitation, and direction of the restoration project. With them I am having so much fun with what should be one of the most stressful projects I've ever been involved in. So .........okay enough is enough. I'm sure you get the point that I feel very blessed and I'm very thankful this holiday season. Now, let's talk about the project and where we're at. Here's a look at it from 16 fairway. A massive masterpiece. The bunker on the left of #7 is really good and also completely sodded. The sandy area in front of this bunker is going to be fairway turf so that is why it's not sodded right now. The fairway turf will come from other areas on the course and we will start that process as soon as we get a chance. All of the bunkers around #7 green are now sodded. This is a very strong green complex. With the new bunkering and attached black tee on the left, it may be the coolest place on the course. This big guy on the left of 16 was finished up yesterday. It really turned out nice. This bunker was moved about 20 yards towards the green, and given the new championship tee will be taken back another 15 yards, carrying this trap will not be possible. The extension of the 9th tee is coming along nicely. Don't worry, some pruning will be done before we expect someone to hit from this new area. The 5 and 8 green complex has been stripped and the shaping is also coming along nicely. 3 bunkers have been removed in this area and the 3 remaining bunkers have been re-positioned and enhanced. Fairway turf will connect these two putting surfaces and in the right hand side of the photo you can see that the new 9th tee extension has been integrated to look like it has always been there. Yes this is a large area of disturbance and for you winter golfers, finding turf here will be a challenge for a while. This is a good time to bring up some guidelines for playing golf on a construction site. If you've fallen asleep on this lengthy blog, then please wake up now and pay attention. If you land in a new bunker, please use the ball retriever to get your ball and don't enter into the new hazard. Many of the new bunker lips are created out of sand and gravelly fill which doesn't pack real well. After the sod has knitted in and the soil has settled, it will be fine to walk on, but right now some of these bunker lips can collapse under the weight of a person. So see where Boo is in this picture.............DON'T STAND THERE! See Boo here?.....................DON'T STAND THERE EITHER!!! Be aware of where the pin is. When we are working on greenside bunkers, a temporary green like the one you see here will be in play. DO NOT SHOOT AT GREENS WHEN YOU SEE WORKERS THERE. If you come to the teeing ground and see no tee markers, don't just hit it from where you want. The markers have been moved for the safety of those working on your golf course. As an example, above you see Boo sitting on the temporary tee for #7. This hole was temporarily changed to a par 3 so we could safely build the fairway bunkers in the area between 7 and 16. So again, if you don't see tee markers, the tee is closed, walk up the fairway till you find them. I know this is a huge inconvenience but please follow these guidelines so that we can get this done quickly and then you can enjoy your new golf course. Oh yeah, one more thing.....................I am thankful for Stanford. Now GO BEAVERS! !